The most spectacular Gothic-style castle in Romania, Corvin was built by the Anjou family on the site of a former Roman camp. The castle served as a fortress until the mid-14th century when it became the residence of Transylvania's voivode, Iancu de Hunedoara (Ioannes Corvinus in Latin, Hunyadi in Hungarian). 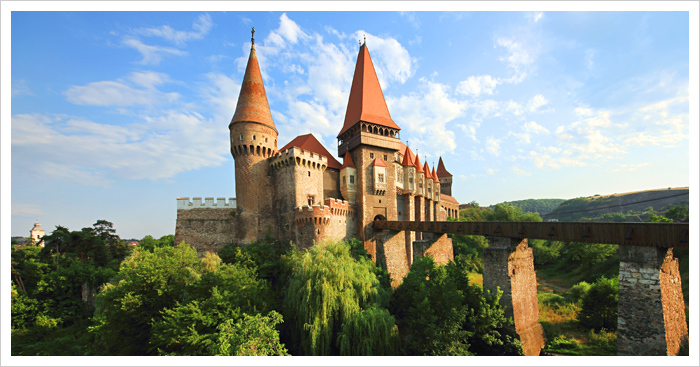 Iancu upgraded the fortress transforming it into a stunning Transylvania castle. During the 14th and 15th centuries, Hunedoara was the main iron extraction and processing centers in Transylvania. Swords and spears manufactured here during this period were renowned across Europe. The castle's courtyard features a 100-ft. well dug into stone, in the 15th Century. Legend says that the wheel was dug by three Turkish prisoners who were promised freedom when job was done. It took them 15 years and 28 days to reach water. On April 13, 1854 a fire caused by lightning have destroyed all the wooden parts of Corvin castle (the roof, wooden beams, stairs, ceilings and doors) except the five-hundred years old door of the dungeon. After 10 years of abbandonment, a 40-years long restoration process began. Although a museum, Corvin Castle occasionally hosts private functions and special celebrations.